The first stitch of every row is slipped purlwise, last stitch is purled. 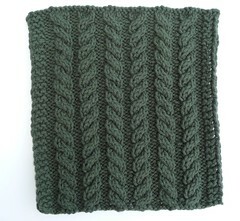 CO 54 and follow the instructions as printed except do not knit the 3 rows at the beginning and end. Work the pattern a total of 7 times.